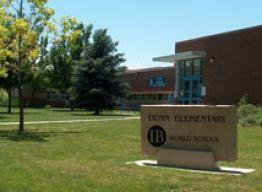 Dunn Elementary School is named after A. H. Dunn, principal and superintendent of Fort Collins Public Schools from 1893-1930. The Dunn Elementary student body includes international students from nearly 30 nations as well as children from the local community. Dunn Elementary is an International Baccalaureate (IB) school, where students actively use inquiry-based learning and critical thinking to master district and state standards. The IB Programme focuses on the total growth of the developing child, encompassing social, physical, emotional, and cultural needs in addition to academics. A key component to IB instruction is service to others. Dunn Elementary students are committed to using their knowledge and skills to better their community and the world. Unique enrichment options such as Positive Picassos, Lego Robotics, drumming club, Japanese language instruction, and Green Team are available; along with other student activities including monthly International Citizens recognition, talent show, and Geography Bee.